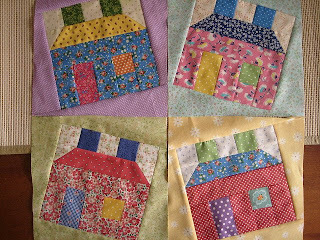 These fun house blocks finish at 7.5" square (before triangle sashings) and are made completely from 2" strips, and scrap, squares! 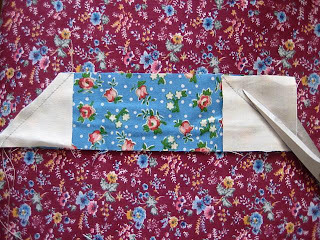 Allowance for 1/4" seams has been included. 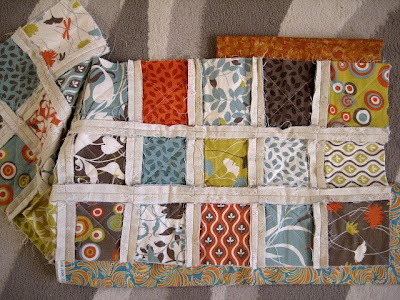 Sew your chimney squares and three of your neutral squares together as shown. In this pic you can see that I have drawn diagonal lines across the neutral squares that will form the roof and background. It is important that you have one uphill diagonal line and one down hill diagonal line so the angles on your roof will turn out right! 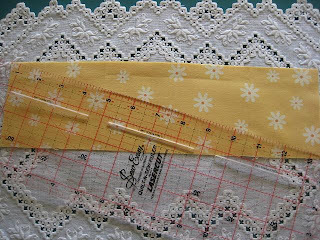 Sew on pencil marks as shown! Clip off the 'dog ear' corners, and press the background triangles out from the roof piece. Use pic above illustrating how to assemble other pieces! 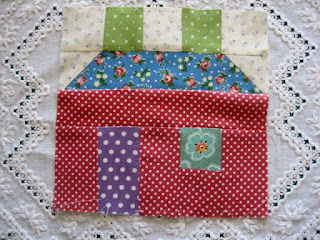 Sew units together and press neatly - now you have your little house, measuring 7.5" square. You are now ready to add the topsy-turvy triangles! This is a little tricky as your houses will go 'uphill' and 'downhill' alternately, according to the block setting. First place both 12.5" x 3.5" rectangles both right side up on top of each other. For the 'uphill' houses you want to place your ruler so that it runs DOWN HILL from upper left to lower right across your two rectangles. 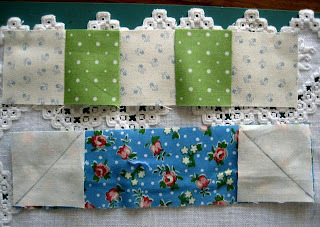 Use your rotary cutter to slice from lower right to upper left, corner to corner, through the rectangles. For 'downhill' houses it is going to be the opposite. Still place both your rectangles right side up on top of each other. 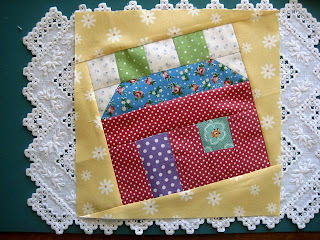 Place your ruler the opposite way from lower left to upper right ... your ruler is going 'uphill' but the triangles will turn your houses opposite, it will be going 'down hill' by the time you sew the triangles to the block. Lay your triangles as shown above - it is important to have the straight grain of the triangles laid against the block! You can see I have sewn the side triangles first and snipped off the ends! 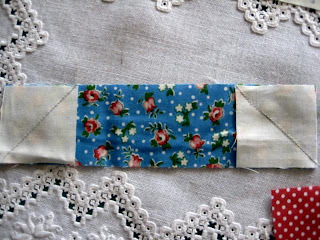 Notice how the straight grain of the fabric is against the block and the 'not quite bias' is on the outside edge. I sew the two side triangles on to the block first. Now, this is how your blocks will be posted to me and we will accurately trim them to 10" square! Your blocks will be returned to you, as above - all ready to be joined together as you so desire! There will be 1/4" float around the joined houses, so you will have all your lovely litle corners intact - I would rather a float than a corner cut off - do you agree! Have a trial run and see how you go - once you do the first block it is easy-peasy! As I said, please email me if you have any questions - I look forward to a lot of Aussie girls signing up and have had offers of from girls in the US to act as hostesses! 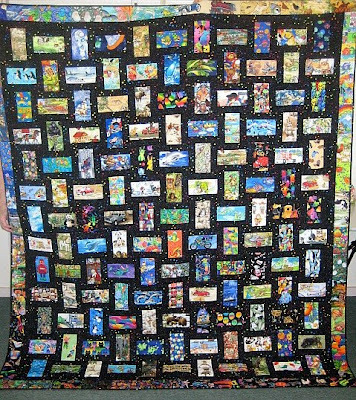 Mmmm, we are going to have some nice wall hangings and quilts and have a lot of fun making them! Seeing I'm PSing, thought I might add progress on Happy Houses - watch this spot - now I'm teasing you - I won't keep it a secret much longer! PS - Oh, this is a late addition - I'm sure Terri of Purple and Paisley won't mind! I just have a feeling some of you may not have flicked over to visit Terri and missed this wonderful pic! Click on the purple and you will go straight there to read the lovely story behind 'The Kiss'! Purple and Paisley has done a Post for me on some very touching, moving American history! Thank you, Terri and as I have said to her, it would soften the toughest heart - please pop over and have a read! 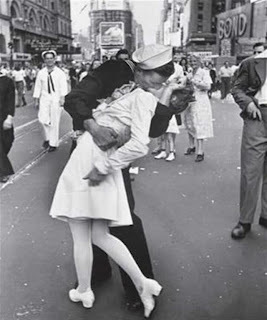 This is a picture of a great Australian moment - The Dancing Man, originally caught on film during street celebrations in Sydney 15 August 1945, the end of World War 2! How gorgeous and you can see by his face and body language he is just so happy! This is a little sneak peek of what I am up to - cute, eh! Back to the sewing machine! Thank goodness! Only 2 days late and after snipping 180 squares, I'm so pleased - better still, Angela loves♥ her birthday quilt! 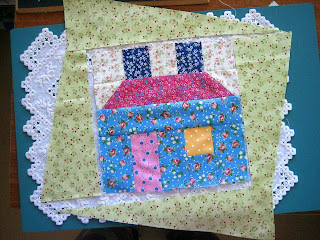 I used 5 packs of 36 Arcadia charm squares that I bought from the gorgeous girls at Provincial Patch - thanks Kerrie and Julie! Fortunately I had previously invested in a pair of Fiskars Snippers (titanium), so no tired or aching hands! Into the washing machine and dryer late this afternoon - mobs of threads and fluff - and now it has gone home with Angela, who can't wait for cool weather to come! Tomorrow is another day, and I am doing trial runs on what could be a lovely new development!Oh, and I must do some Blogland Visits and Replies! The First Fleet of ships to carry convicts from England to Botany Bay sailed from Portsmouth, England, on 13 May 1787. It arrived at Botany Bay on 18 January 1788. When that place proved unsuitable for a settlement the fleet made its way a short distance up the coast and on 26 January 1788 entered what is now known as Sydney Harbour and anchored in Sydney Cove. That's what this great day is all about and why it means so much to Australians. When we were kids, nobody would want to be labelled with convict ancestry - nowadays we are so proud of our history! 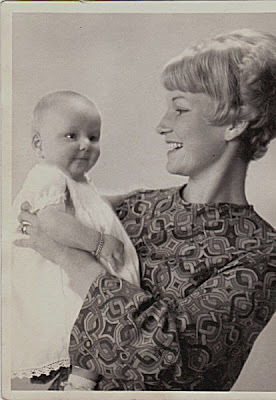 Thanks goodness it all did happen or I wouldn't be here - I come from good convict stock (lol)! 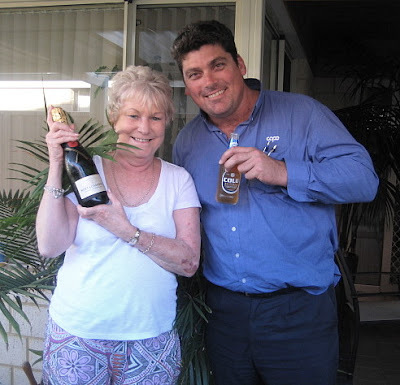 It's beer and prawns here today - no beer for the girls - we are good old Aussie wine drinkers! Of course it has to be at Mum's Place (i.e. 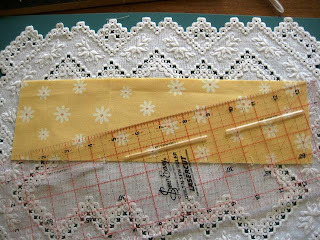 Lurline's Place) - so no sewing today - may get a little done tonight! Oh, how old and loved do they get! 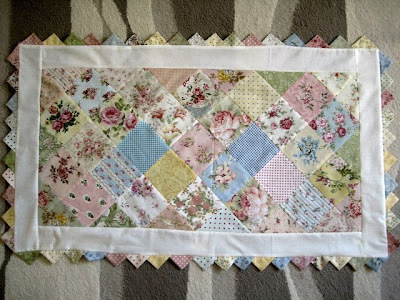 This is my puppies quilt and cushion - quite faded from lots of washing and yes, drying in the sun! 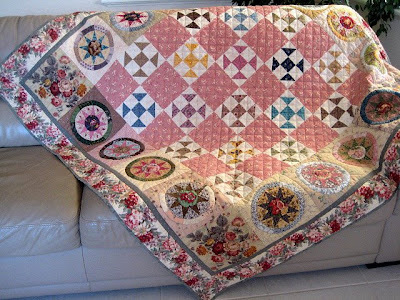 Made from gentle repro fabrics and I think this is still my very favourite quilt - may make a similar one again soon! I know, I know ... I should be at the sewing machine making Angela's quilt - have only one charm pack to add then all the binding, snipping, washing, drying - I still have until Tuesday and I need a little respite! 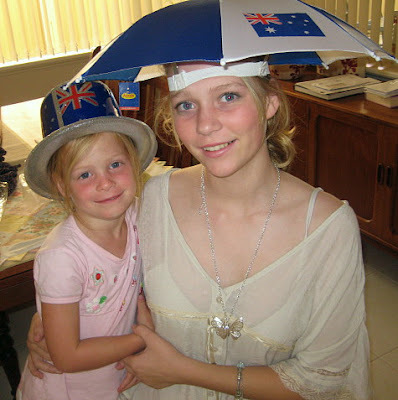 I love my grandchildren - look at these two little beauties getting ready for Australia Day tomorrow - aren't they funny - we really do have lots of laughs in this family and a pretty weird sense of humour! I have just Posted on The Great Hexagon Quilt-Along - do pop over if you are interested in a bit of useless prattle and trivia! Another oldie! I hand-pieced all the Mariner's Compass blocks and then appliqued them to to the quilt, then hand-quilted it. 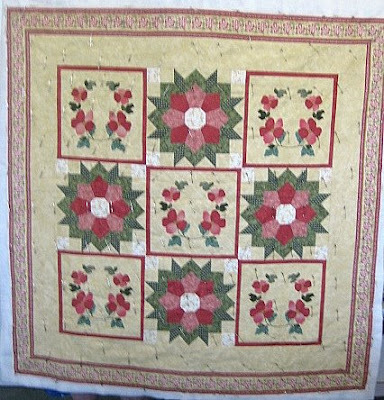 The floral border has a cable design quilted on it - a bit lost in the pic, but nice in real life. This is a cuddly, utility quilt, always on our bed, though I must admit it is being kicked off a bit in this hot weather! 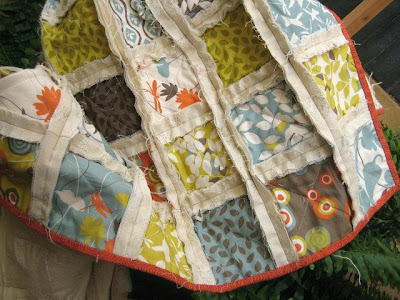 Above - Angela's Raggy Quilt - I'm still on a mission and off to continue sewing soon! 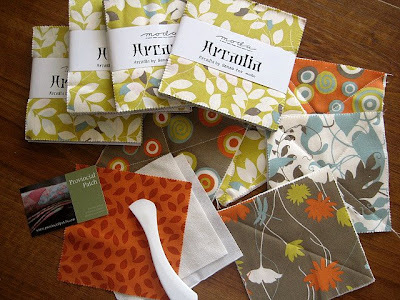 I didn't have a lot of joy finding the perfect binding fabric yesterday - lower fabric, from my stash may work - don't think I like the orange up top! Nice to know a lot of you really make use of the Hera marker, too - a great little tool for marking quilting lines like this! New on my sidebar! Mel has had a makeover - click the button to see what it is all about and pop over to see her! No little children today, so off to sew! Here I go ... doing silly things again! 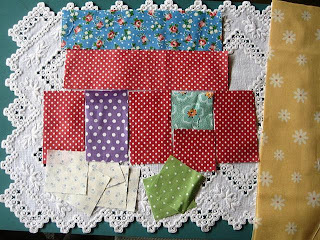 Today I have started to make a raggy quilt for DD, Angela, for her birthday on the 27th, yes, January - as I say - wish me luck! 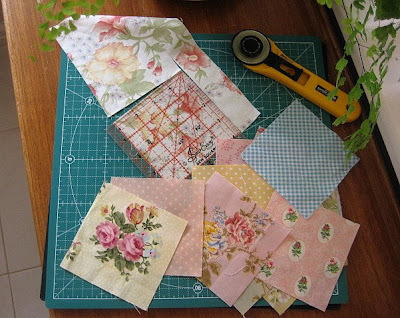 I bought these great charm squares from Kerri's and Julie's Online Quiltshop - Provincial Patch! For all your Aussie girls - great 30% sale there until the end of January and Kerri and Julie are so lovely! Now, I have five charm packs of Arcadia by Moda and figure with 1/2" seams allowed, I should end up with a lap quilt approx 68" x 55". I have lovely Quilt Lite batting (this being cotton, it will fray very nicely!) on hand and had some Fusions backing fabric, purchased at a sale, so this will be a very cheap quilt. Look at that funny white plastic thing - it is called a Hera Marker (by Clover, I think) and one of its uses is to mark quilting lines that will become invisible - see the lower brown print fabric. I should be able to whiz through the quilt-as-you- go quickly! I have my dear wee grandson, Byron (one of 4-year old twins) with us for a few days? (am sure you all know about the boredom of school holidays and kids fighting!). Guess who is going to give into anything his little heart desires, so I can get this quilt done? 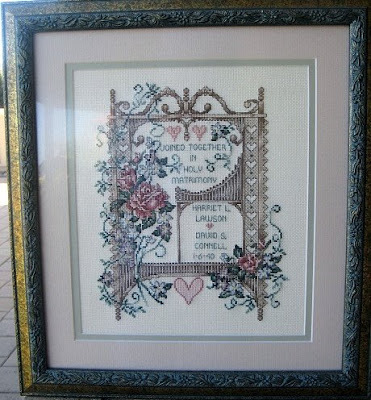 A cross-stitch for Mary Grace to see! Isn't it a bit sad, at the time when I stitched a lot of cross-stitch pieces, it wasn't fashionable to put a date on it - my goodness, this could have been done early Nineties, I think! It is a bit of a shame as it would have been so easy to write on the backing to the frame - never mind! As you can see, Mum and Dad were married 1940 - dear Dad we lost in 83 and Mum now lives with me at the grand old age of 90! This I made for her! Yesterday's effort - no it's not a pillowcase, as DD, Angela, thought! 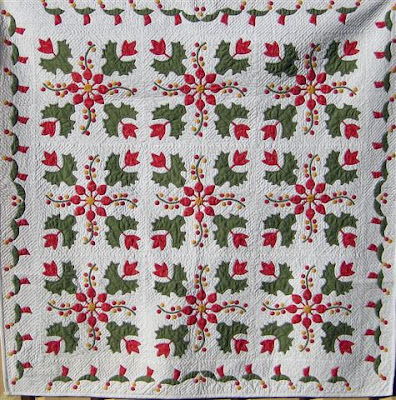 It is a table runner! 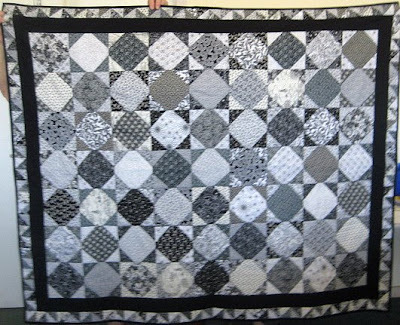 Not sure how I will quilt it - either machine or large-stitch hand-quilt with Perle thread! I still have quite a few shabby chic scraps, so thought it would be a change from the modern, bright mood I am in at the moment! It's a new week, so chores to be done! I'm not going to chatter on today - DS is home and I know he will want to use the computer when he gets out of bed. David is working down in a remote town where a gold mine is being developed, he is away from home and works long, hard hours, so it is a little treat for him to use the computer if he is home on Sunday. Above - gorgeous retail therapy yesterday! Had a lovely day with the girls - went a bit crazy, but it will all stop soon - I need to sew to use up fabrics and patterns - all so tempting, though! Aren't the little Tootsie Rolls in the front just gorgeous - I have a plan in mind! The white with the tiny red dot will probably be used on my Hexagon Medallion - maybe the blue with little roses will get used on it, too - we'll see! 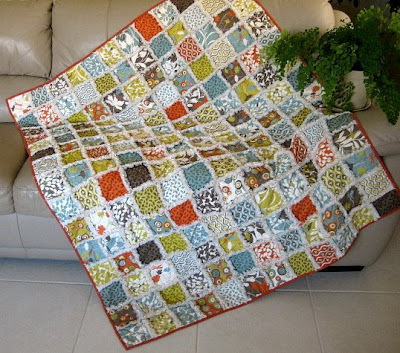 I'm going to try to knit an edging for my True Friendship Quilt - the one Christine sent back to me - I'm not full of confidence about it, but I'll try! Please pop over to Clare's Craftroom to see Clare's 50th Post Giveaway - I'm tickled pink about it! Last but not least for today - I'm sorry, I am behind in replying to a lot of your lovely Comments - I so love to hear from you all and so appreciate your feedback and I promise I will try to keep up to date in the future! Julia has honoured me with this award ... thank you Julia for thinking of me! 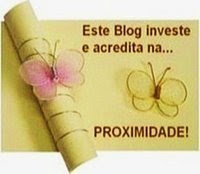 The meaning of this award: This blog invests and believes in Proximity - nearness in space, time and relationships. These blogs are exceedingly charming ... These kind bloggers aim to find and be friends. They are not interested in prizes for self-aggrandizement! Today there hasn't been a great deal achieved around here - see below where I am trying out Julia's Christmas present to me - a Rotating Cutting Mat by Olfa. I think it should be rather good once I get to rely upon using the mat rather than turning the fabric. I have 42 x 4"squares to cut for a runner, then 60 x 3" squares for prairie points and I really don't feel like cutting at all! Here's the reason - son-in-law Ben turned 37 yesterday and he bought the girls a bottle of Moet & Chandon - beautiful champagne! Then I had a really early start today taking Mum for a hearing test and oh, the heat is dreadful! Even in the aircon I still feel hot - maybe it is this room! 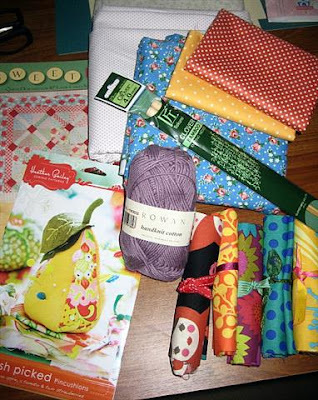 Had a lovely day at local patchwork group yesterday - here's some goodies! I Spy - by Jean! Black and White - by Gail! Applique and Piecing by Helen! 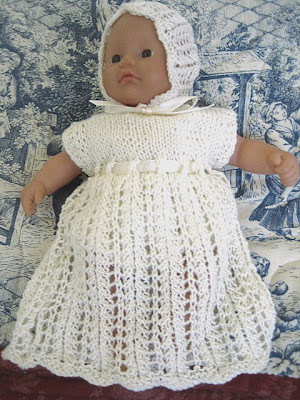 Knitted Dolly's Outfit by Maureen! I'm looking forward to tomorrow - some retail therapy and coffee with friends! "I love my girlfriends, getting together with my gal pals is my favourite thing. Women are each other's human 'wonderbras' - uplifting, supportive and making each other look bigger and better - by Kathy Lette, author. 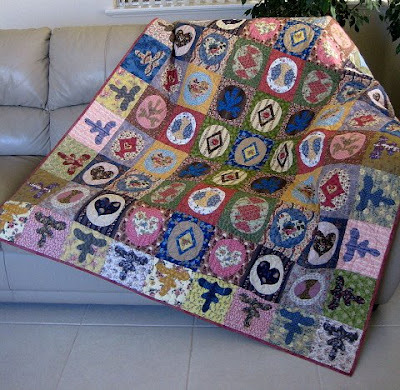 Firstly, for those who visit Christine's blog, Once Upon a Quilt ... , this quilt will most likely look familiar! On Monday I had one of the best surprises I have ever had - quite a story! 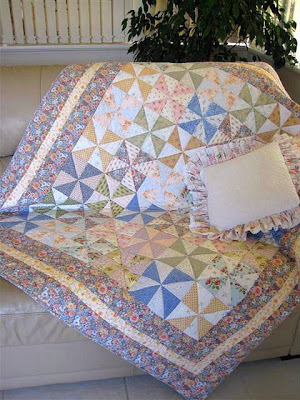 Christine and I started making quilts from this pattern at the same time - I had been lucky enough to be able to organize to have Kim McLean to do a workshop for us while Kim was holidaying on the Gold Coast, Queensland, Christmas 2003. 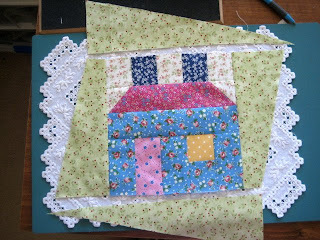 The workshop was on 'Old Brights' - Kim's design inspired by a Great Australian Quilt. in her quilt - so much work, I thought, I shouldn't let it go to waste. 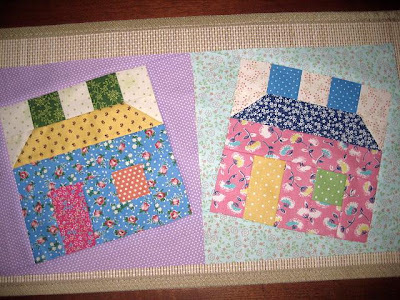 Just recently, Christine showed the darling quilt on her blog - she had made the quilt from my blocks - made me feel a little sad, but I moved on - I was pleased she had used them! Lo and behold, the puppies barked at someone at the front door on Monday and there was a rather large parcel - 'Not expecting anything? 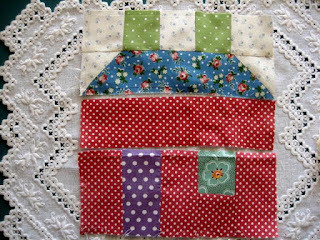 ', I thought and here were my beautiful blocks back, all pieced, quilted and bound! Does this little story make you teary - friendship is life-enriching and I am one of those very lucky people who shares and truly understands its meaning! Thank you, and I love you, Christine! Still Dilly Bagging this week - here's anothery- inspired by gorgeous friend, Pat! 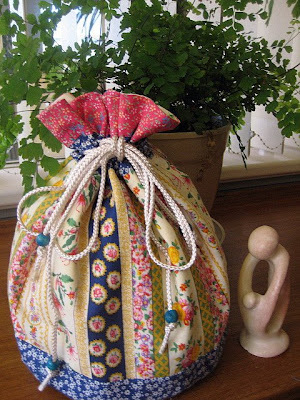 Wikepedia says the origin of the dillybag is from the Australian Aborigine - a vessel used for collecting food - I'm sceptical - I thought Victorian ladies wore little dillybags over their wrists? Latent memory and all that useless trivia in the grey matter! See the little Easter Bunny on my sidebar - please pop over to see Julie at Bush Baby Jag - she is organizing an Easter Swap - should be a lot of fun! We had a fabulous day out yesterday with the Girlfriends, see Julia's pics at Julia's Place, tomorrow off to local patchwork group - yes, the busy days have started again and I have been so enjoying my time at home, too - must try to allow myself plenty of time for sewing this year, and blogging, too, of course - I'm so happy in Blogland!